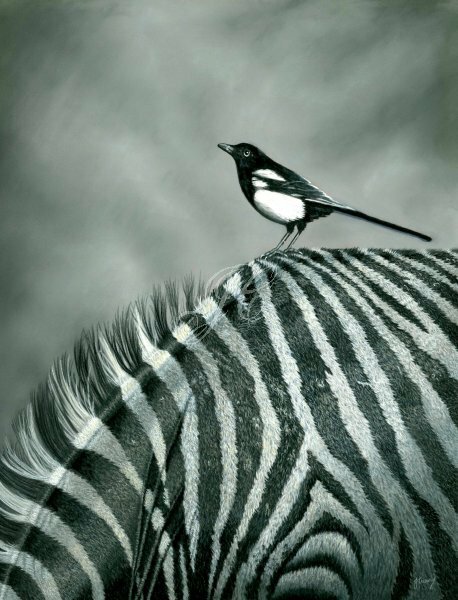 This stunning monochromatic piece depicts two friends against a stormy sky, both striking in black and white tones, with a Magpie sitting on a Zebra. I love the striking contrast of this piece set against a dramatic sky. Artist Quality Pastel Pencils and Soft Pastels on Pastelmat. Size is 12 x 16". Reference photo by Paul Fine. This original painting has sold however I have a range of Fine Art Giclee Prints available in a range of sizes.